It's Crawley's most celebrated building: a 17th-century, Grade II listed former coaching inn. 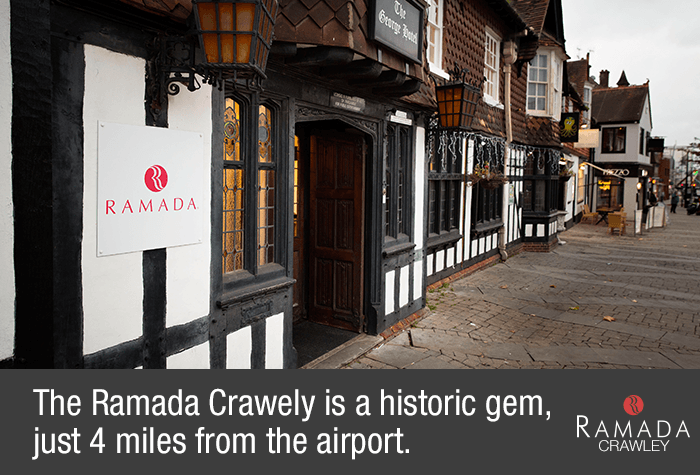 The Ramada Crawley Gatwick just oozes history and character. It's also the only Gatwick airport hotel in the centre of Crawley, so perfect if you dont want to spend your evening on the edge of the airport. The Ramada Crawley is within easy walking distance of numerous pubs, restaurants and shops, including the large County Mall shopping centre, and also has two on-site restaurants and a lively bar. If youre up for getting the holiday started with a night out before you jet off, then this is the hotel for you. Yes, all were as described. Excellent service from Holiday Extras. Very happy with the price and hotel/car parking deal. The hotel was lovely with very helpful staff and I couldn't recommend Purple Parking highly enough! Would definitely use again. The parking was fine, the hotel is a nice hotel but the Block at the back (Sussex wing) where we are always put is very dated. The good thing is that it is in the high street so all pubs and restaurants are easy to get to. 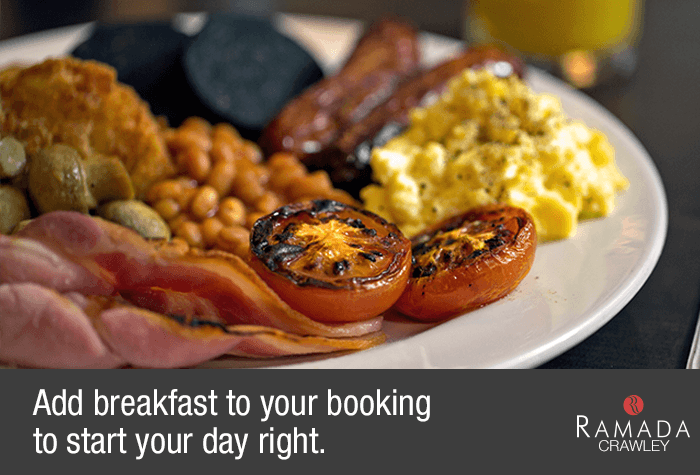 Our customers rated Ramada Crawley-Gatwick on average 8/10 (258 reviews). 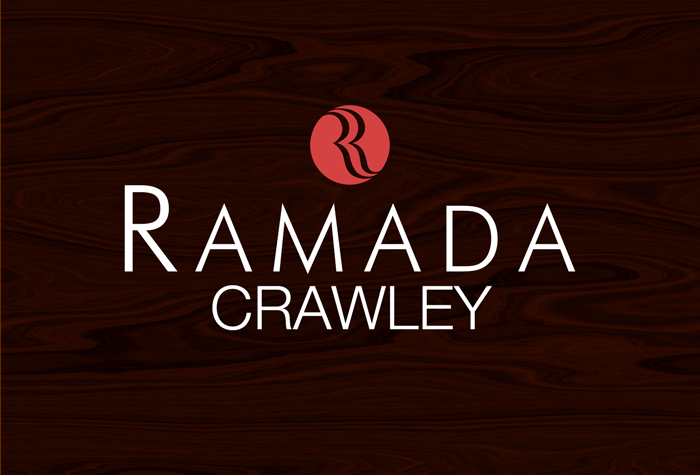 Read Ramada Crawley-Gatwick reviews. The Ramada Crawley is easy to find if you're travelling by car - it's on a main road, just seven minutes from the M23. You can park overnight for free in the large on-site car park and leave your car there while you're on holiday too. If youre coming by public transport, Crawley rail station is just a five-minute walk away. Trains run regularly from here to Gatwick airport and London. You can book a taxi to the airport through the hotel for a flat fee of £8.50 per room. The journey takes just 10 to 15 minutes, but allow plenty of time as traffic in the town centre can be busy, especially during rush hour. The Ramada Crawley has two welcoming restaurants: the affordable Wusungdan all-you-can-eat Chinese buffet, and the more formal Giggling Squid Thai restaurant. Theres also free wifi throughout the hotel. Character - the Grade II listed building was once one of the most important coaching inns in England and over the centuries has been associated with royalty, smuggling, bareknuckle boxing and more. Families - There are rooms for two adults and either one or two children, which are spacious enough for even the most rambunctious of families. The extra beds are a decent size too. Night owls - Tucked away from the bedrooms is the Octopvs bar, which serves cocktails until 1am. This is Crawley's latest-opening bar (only the nightclubs serve until later) and theres a party atmosphere in here most nights, as local revellers lounge on chaises-longues and lean against Roman statues. Public transport - Crawley train station is a five-minute walk from the Ramada Crawley and links the town with London Bridge and London Victoria, as well as Gatwick airport station, just eight minutes up the line. Once youre here youre in the town centre and can walk to any of the local attractions. Food - The hotel has two restaurants, and there are numerous bars, pubs and restaurants on the High Street right outside. You can even order Thai room service  something we have yet to see anywhere else in the UK. Rooms are spacious and they all have free wifi and en-suite bathrooms. 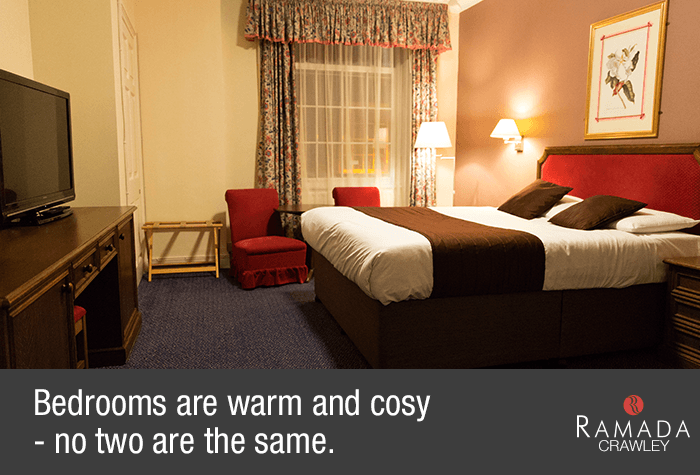 The Triple Room layout includes 1 double and 1 single. The Family Room layout includes 1 double bed and 2 singles. Please note the family room sleeps up to 2 adults and 2 children, the child age limit is 15 and under. The hotel can book a taxi to take you to the airport in the morning for you. 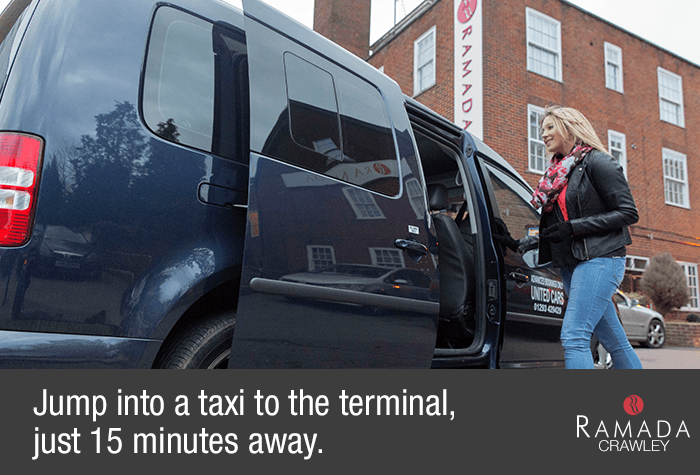 A standard size taxi will cost £12 one way or £18 return. 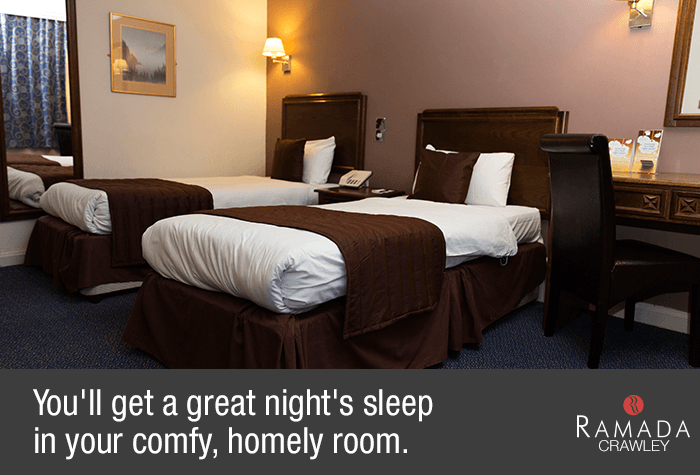 The Ramada Crawley is a 15-minute drive from both terminals in good traffic. Driving instructions and a postcode for satnavs will be on your confirmation. Overnight parking is available - its included in the price. Check in from 14:00 and check out by 11:00. There is free wifi throughout the hotel - its a medium speed and may be slower at busy times. Standard rooms at the hotel are spacious and each one is a little different. The hotel doesnt have a lift, so we recommend asking for a ground floor room if you have limited mobility or lots of luggage. Rooms include: Free wifi, TV, Tea and coffee, Hair dryer, Trouser press, Phone, En-suite bathroom. The hotel does not have its own restaurant, but dinner is available in the Giggling Squid Thai restaurant next door. Or, venture outside into the town where there is a range of popular bars and restaurants to choose from. Tuck into an English and continental buffet for £9.95 per person - add it to your booking on the next page. Its served in the hotels Russell Suite from 06:45 until 09:30 during the week and from 07:30 until 10:00 at weekends. Ask the hotel to book you a taxi to the airport when you check in. The taxi will cost around £12 one way for up to 4 people and will take about 15 minutes to reach the airport. There are no accessible rooms, so we recommend opting for one of our other, more accessible Gatwick hotels if you have limited mobility.